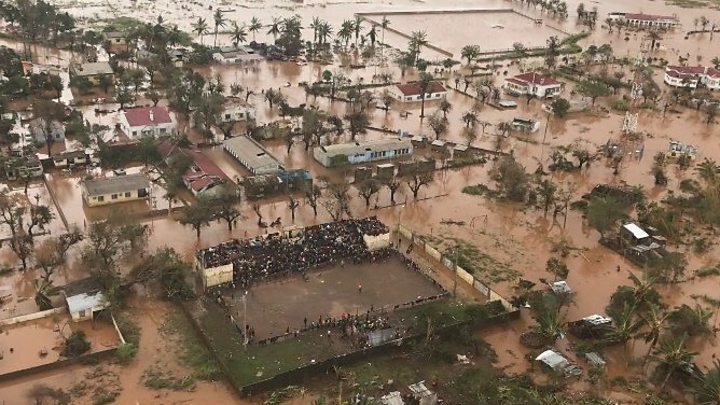 An appeal to help the survivors of Cyclone Idai has been launched by the UK's Disasters Emergency Committee (DEC). At least 300 people are confirmed dead in Mozambique along with another 100 in neighbouring Zimbabwe, but the death toll is feared to be much higher. Aid workers in Mozambique say there are only two or three days of clean water left in the devastated city of Beira. Although supplies have begun to arrive, some communities remain cut off. Thousands of people are stranded by catastrophic flooding, clinging to roofs or stuck in trees, charities say. In a statement, DEC said its members were working closely with national organisations to deliver emergency shelter kits, food, water purification tablets and medical help. Penny Mordaunt, the UK's International Development Secretary, described the cyclone as "one of the biggest natural disasters" to hit the southern African region. Broadcasters including the BBC will show the DEC fundraising appeals on Thursday. Ben Webster, head of emergencies at the British Red Cross, said Idai had caused "a severe humanitarian emergency". "People living in the path of the storm have seen family members lost in the floods, they've seen their homes and livelihoods washed away," he said. "Right now the primary focus is to save lives, but the after-effects of this crisis will be felt for some time to come."